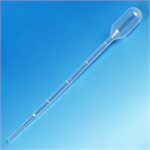 1.2 ml Transfer Pipette (Polyethylene). 2 1/2 inches Total Length. 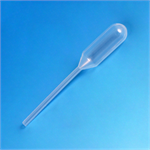 3 ml Graduated Transfer Pipette (Polyethylene). 5 1/2 inches Total Length. 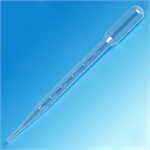 4 ml Transfer Pipette (Polyethylene). 3.4 inches Total Length. 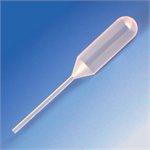 7 ml Graduated Transfer Pipette (Polyethylene). 6 1/8 inches Total Length.